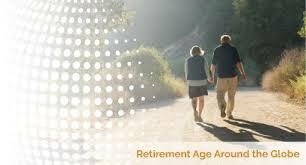 Most people spend the bulk of their adult years in the workforce so retirement represents freedom and rest. We researched the official retirement ages for people around the world and noted in some featured countries what retirement policies are in practice, and what they mean for the future. Click around the interactive graphic to see how the world’s workforce views retirement. While most countries hover around the 62-65 age range, there are a handful of countries that plan for workers to leave the workforce even earlier. The United Arab Emirates (UAE) boasts the lowest official retirement age at 49 years old, though the age is 60 for expats (non-UAE nationals). The retirement age has increased steadily in the past decade from age 40 in 2007 and is expected to climb to 50 this year for UAE nationals. While there is little data on UAE nationals who are retired, there’s evidence that UAE expats try to stay in the UAE after retirement, even though certain policies prohibit it. Many expat retirees find loopholes to avoid having to leave. China has the second lowest age for retirement, with the average age 56.25. Because 15% of the total population is of retirement age or above, there are rumors of changing the age to help combat the effects of an unbalanced labor population. The African continent hosts several countries that have low retirement ages. Senegal, Mozambique, and Madagascar are the lowest at 57.5, while most hover around 58-60 years of age, such as Egypt, Tunisia, and Morocco. There isn’t much information about social services, government programs, or workforce stats but considering so much of workforce is involved in agriculture and labor, over time, a person’s ability to work is affected by the physical toll it takes on their body, and earlier retirement might be necessary. Other countries, like Russia, Japan, and India, have retirement ages closer to 60, and with large populations of older or retired people. Family obligations, limited opportunity, and rampant poverty keep these large older populations from traveling away and keep them in the workforce longer to be able to make a living. Some countries expect to work later into their years. In Norway, 67 has been the official retirement age since the 1970s and there currently are no serious proposals to raise the retirement age. In 2011, Norway established “flexible retirement” for earnings-related pensions, meaning that Norwegians can draw pensions as early as age 62. Some social science data suggests that Norwegians preferred to retire at 61, then the age rose to 64 in 2013. Many retirees choose to spend their golden years living abroad, if possible, with the US, Spain, and warmer climates as popular destinations. With among the higher official retirement ages, Italy, Ireland, and Portugal are probably not top destinations for retired expats, because they might have to come out of retirement to live there. To learn about assisted living services, click here.